Portronics, a trusted name in field of innovative devices and gadgets, launches its new opulent Bluetooth speaker - “POSH”. 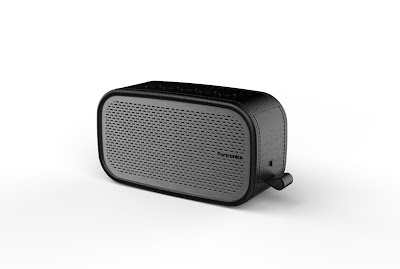 True to its name, this swanky, stylish and powerful audio gem offers two 3W inbuilt speakers for great audio performance, you always wanted from a great portable speaker. cool looks, fine leatherette finish, robust design, premium sound quality, ultimate convenience and is available at an unbeatable price too. Many portable Bluetooth speakers compromise on audio quality, especially at high volumes, and the finer aspects of music get lost due to design constraints. This is where POSH fills the gap. Its unique design ensures that you will never miss a beat. POSH is designed specifically for portability and on-the-go- use. Just sync it with your phone, tab or computer and experience the wire-free music. Also, while enjoying your music from the phone, with just a click of a button, you can also receive incoming phone calls and converse using the inbuilt high quality microphone. · POSH comes with two 3W inbuilt speakers for that great audio experience you always wanted from a great portable speaker. · It weighs less than 300 gm, it’s lighter than most of the Smartphones available in the market today. · The buttons are placed conveniently and the soft Leatherette finish ensures anti-skid and a pleasure to hold experience. · POSH can connect with your device(s) through Bluetooth; therefore, you do not need to carry a USB cable or any kind of wires to play music on this amazing device. · POSH is also equipped with AUX-IN which lets you connect your device(s) through a wire. You may use AUX when the phone is running low on battery and you do not want to use Bluetooth in an attempt to save its power. · The volume button lets you control the sound output from the speakers and can also be used as a skip button for songs. The new Portronics POSH is priced at a very striking price-point of INR 2499/-. It is available in two cool colours to suit your taste-Grey and Black. For additional information please visit, http://www.portronics.com .